What will happen if I reset the router? Once you reset the router, the settings will be reverted to its factory defaults. All of the customized settings of the router (Wi-Fi name (SSID), wireless security, etc.) will be erased. IMPORTANT: If you want to restore the router’s original settings without re-configuring it, you have to save a backup file. To learn how, click here. Locate the Reset button and, using a pen or a paper clip, press and hold the Reset button for 10 seconds. QUICK TIP: For router models such as the Linksys Wireless-B and Wireless-G routers, press and hold the Reset button for 30 seconds. QUICK TIP: Observe the Power light of the router while pressing the button. It should blink or flash as an indication that the router is properly resetting. Unplug the router from the power outlet for 30 seconds. Plug it back and wait for the Power light to turn solid. 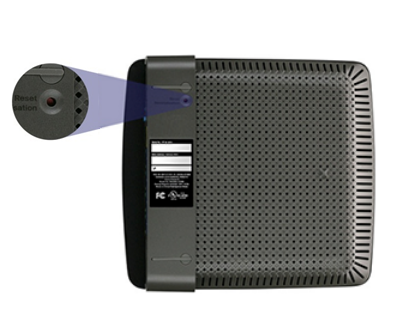 IMPORTANT: For the newly-released Linksys Wi-Fi Routers, unplugging the device from the outlet is no longer required. NOTE: Images and steps may vary depending on your router's model number. Using a computer that's connected to your router, open a browser and type "192.168.1.1" in the Address bar then press [ENTER]. If your router's IP address has been changed, use that instead. If you are using a Mac® to access the web-based setup page, click here. Once prompted, enter your router's administrator credentials to log in. The default password is admin and no username. If you have changed your router's administrator password, use that instead. When the router’s web-based setup page appears, click the Administration tab.